Sandy Springs Dental: How Much Do Dental Bridges Cost? The cost depends on the type and complexity of the bridge required, the expertise of your dentist and the area of town the procedure is performed. Typically the cost ranges from $1.100-1,500 per tooth. Dental insurance will typically pay a percentage of the fee, usually half, depending on the individual dental plan. It is important to keep your remaining teeth healthy and strong as the success of the bridge depends on the solid foundation offered by the surrounding teeth. Brushing twice a day and flossing daily helps prevent tooth decay and gum disease that can lead to additional tooth loss. Keeping a regular cleaning schedule will help diagnose potential problems at an early stage. With proper care a dental bridges can last 5 to 15 years, even longer. With proper TLC, it is not unusual for the life span of a fixed bridge to be over 10 years. If you’re a new patient, there’s often an initial office visit ($65-$102) and X-rays ($85-$135). One must not forget that there are additional costs that contribute to the overall price involved in dental bridges which are beyond the patient’s control. The costs above does not include the cost for any anchoring on either side of the bridge. So a 3 unit bridge could cost around $3,500 to $5,000. And at that point as noted below you might want to consider implants. A large share of undervalued costs goes toward the treatment itself, lab and production costs for the bridge, aftercare and the like. 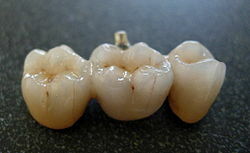 Dental care on a whole is often considered expensive. But depending upon the general wear and tear a bridge is exposed to and how well you keep your teeth free of plaque, it could last indefinitely. With somewhere between 10 and indefinitely, the investment becomes rather modest, if not inexpensive. In the alternative, if the cost escalates, you might want to consider a single dental implant with a cost of around $4000 to $6000. The benefit on an implant over your lifetime could be less expensive than a bridge and is the more natural state of the art replacement of a missing tooth. Dental implants are considered the standard of care in modern dentistry, which is something we do in-house. If we can be of service or answer any of your questions please do not hesitate to give us a call. Is should be noted that both location of the missing tooth, the number of teeth involved or missing or whether there are virgin teeth or repaired teeth in front or behind the missing teeth come into play in the decision making process. Also, keep in mind a dental implant is the superior choice for replacing a missing tooth. The recommended standard of care for a single tooth missing is a single unit implant. However, there are limiting factors, including insurance coverage that come into play in the decision making process. Next postDentist Sandy Springs: How much does having a tooth pulled cost?